first of all, if you've never been here, this place is much more restaurant than wine bar and it certainly isn't a dive. max’s offers gourmet comfort food, decent wine prices, and a kitchen that closes late. it has a loud, energetic atmosphere, great for dinner with the girls on a tuesday or saturday night. if i didn’t worry about calories, i would eat here twice a week. but i've still been here at least a dozen times. last night was my third visit since the departure of chef jonathan jones who left for the executive chef position at the new americas in the woodlands. the menu hasn't changed too much and i hadn't really noticed a drop in the quality of the food until last night. later on in the evening, i learned that max's has gone through three chefs since JJ left and a friend of mine was just recently hired there. we went in last night hoping he would be there. he was not. i rave and rave about the fried chicken. in fact, i have probably ordered it the last 4 times i was here. it's wonderfully flavored and always moist inside. 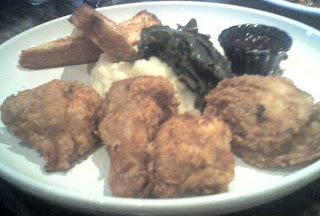 but last night i realized that i'm in love the composition of the whole dish -- crispy fried chicken, creamy marscapone mash, bitter collard greens, and sweet, smokey chipotle honey. texas toast is garnish b/c when i finally get around to it, it's always cold. last night the chicken was fine, maybe a little more greasy than usual, but the mashed potatoes were bland and the collard greens were undercooked & fibrous. btw, i checked the description of the mashed potatoes on the menu online and it no longer says they have marscapone in them. cost cutting? come on, this IS an $18 plate of FRIED CHICKEN. 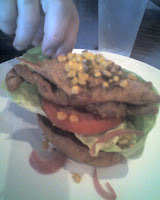 onto other people's food, michael got the softshell crab special. 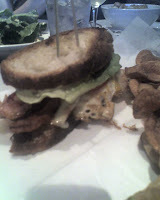 it was served as an open-faced sandwich and was dressed with a tasty aioli. he gave me a generous portion. i enjoyed the dish immensely. paul got the fried egg sandwich which i have had before. it is a monstrously messy affair. max's describes it as "Three pan fried eggs, drizzled with truffle oil and maldon sea salt, topped with three slabs of applewood smoked bacon and Veldehuizen gruyere, organic bibb lettuce, hot house tomato, and garlic black truffle aioli. All sandwiched between two pieces of artisan sourdough and served with hand-cut chips." unfortunately, this dish is anticlimatic for me. i end up with lots of runny yolk, good bacon flavors, but not enough truffle. what a tease! lea got the caesar salad and truffled mac & cheese. 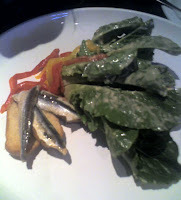 i do like how the romaine lettuce leaves are served whole the way cardini conceptualized the dish. the leaves are supposed to be picked up and eaten with your hands. the huge white anchovies are a nice touch. the mac & cheese is rich and creamy, but not to die for. 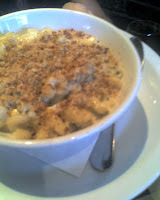 i prefer the truffled mac at oceanaire to this version. 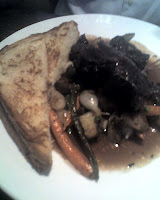 steve had the yankee pot roast made with locally sourced kobe beef cheeks. i had a small bite and for cheek meat (my favorite), it wasn't very memorable. 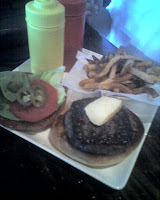 dimitre had the kobe burger topped with brie (photo above). i'll give this place another go when i know there's a different guy in the kitchen. btw, if you are industry, they'll give you 15% off your bill. last night, they discounted our wine too.